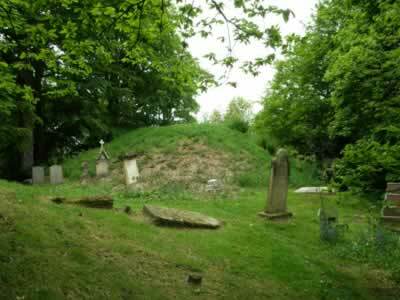 Ryton Motte is a medieval earthwork motte and bailey fortress, built above a fordable point of the River Tyne. On the well-defined flat-topped motte which was previously interpreted as a Bronze Age tumulus, are traces of a very narrow trench. Commanding a projecting hill spur, to the north are the steep slopes to the river and to the west, is the gully of Church Dene. The base of the motte has been slightly mutilated by graves and to the south, a wide curving ditch cuts across the spur from east to west. An early 13th century chapel probably stood inside an attached bailey, which could be the landscaped churchyard of the Holy Cross Church. 5 miles east is Prudhoe Castle and 7 miles east is Newcastle Castle. Ryton Motte is located in the village centre, off Barmoor Lane. 7 miles west of Newcastle upon Tyne, on the A695-B6317. The site is in the churchyard and is freely accessible in daylight hours.